The housewarming began before Renee and Bruce Balter’s new home in Oak Bluffs was even built. At noon last Wednesday, the Balters and onlookers watched as a giant crane carefully lifted the second story of a 2,400-square foot modular design home manufactured by Westchester Modular Homes, swung it past a telephone pole and prepared to set it in place on top of the first floor, which had been set in place hours earlier. 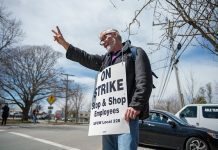 About a dozen enthralled friends and neighbors had gathered in front of the Balter’s 10,000-square foot lot at 8 Gorham Avenue at the corner of School street just down the street from Oak Bluffs town hall. The well-wishers were there because the Balters have lots of friends on the Island and many of them had never seen a modular home set up in one day. “That’s our bedroom. This is unbelievable,” Ms. Balter, an artist, said. She laughed as she watched the crew guide the second floor section gently to its resting place on the first floor, which had been anchored to the foundation earlier that morning. Paula Catanese, playing hooky from Craftworks, her store in Oak Bluffs, stood next to her friend. “Yikes! Don’t drop it,” she counseled the “set crew,” as the assembly crew of modular homes are called. “Paula, see that little bump out on the first floor? That’s the living room,” Ms. Balter said. Her new home has seven rooms in all, including four bedrooms and two baths. “Does it have electrical outlets in the walls?” Ms. Catanese asked general contractor Bill Potter of Squash Meadow Construction. “Yep, it’s fully-wired, just needs to be plugged in. the walls are primed and ready for painting and the cabinets are already in,” Mr. Potter said. Ms. Catanese’s wonder was understandable. 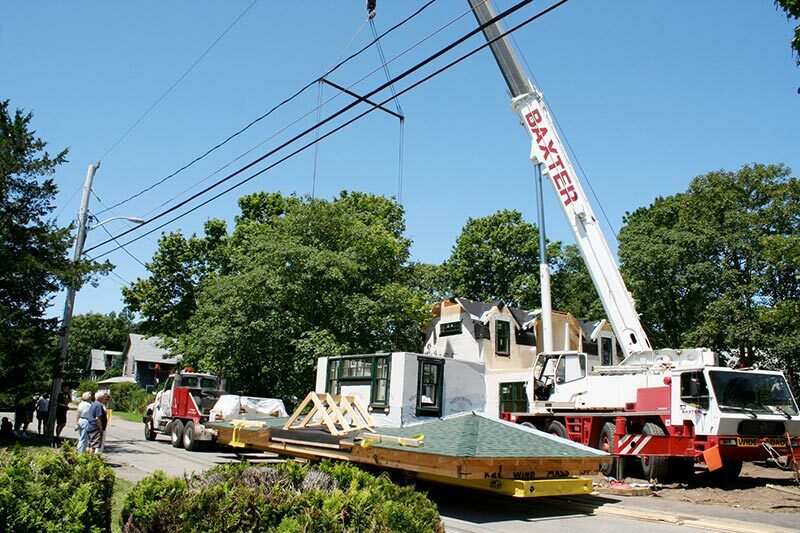 On Tuesday, 8 Gorham Avenue was a vacant lot awaiting the arrival of seven pre-built “boxes” or pieces of the home, journeying from New York to New Bedford and barged to the Island. In five and one-half hours on Wednesday morning, the set crew had put five of the seven modules in place. He said the house would be move-in ready in a few months once the on-Island crew installs exterior shake shingles (the roof arrived with asphalt shingles in place), interior wood floors, a heart pine counter top in the kitchen, and an outdoor deck. “We sold our house in East Chop in Oak Bluffs and leased it back while we looked for a downsized house,” Ms. Balter said. “We couldn’t find anything we liked and this lot came on the market so we bought it and decided to build,” Bruce Balter, a therapist, added. In consulting with Mr. Potter regarding their plans, the Balters asked whether they could save time and money with a modular construction build. The goal was to build a house on a tight budget with 2,000 square foot of living space that included a screened porch that would epitomize the architecture and charm of Oak Bluffs. The resulting “non-modular” design includes dormers, a studio for Ms. Balter’s art, and custom-designed windows. Noting that buyer choices and options can create a wide range of comparable savings from modular versus stick-built construction, Mr. Potter said a modular house like the Balter’s would average about $200 a square foot, including everything: freight, foundation, finish work, architectural fees, even appliances. The stick-built square foot rate on-Island is about $250 per square foot, he said, though buyers can find ways to shave the price, such as providing their own appliances. “I’d say this house provided about 10 per cent in savings rather than 20 per cent, because of its customized design features,” he said. The numbers Mr. Potter provided indicate that the Balters will spend about $400,000 and save about $40,000, as well as eight months of waiting for their new home to be completed. Mr. Potter said that technology has helped the design and modular build process. He said that Westchester sends an architect who works with clients to design their home in real-time on a computer. The design can literally be accomplished in a day. The images are three-dimensional and can be changed and viewed from all aspects so the look of the finished house is easy to see. “We interviewed seven companies and Westchester won hands down. They build green and they do what they say they’re going to do,” Mr. Potter said. Mr. Potter has been building houses for nearly 25 years. He said modular design and construction now accounts for about 20 per cent of his business. The Westchester design/build facility is in Wingdale, in Dutchess County, N.Y. near the southwest corner of Massachusetts. Shipping pre-built homes to an island doesn’t present a particular challenge, John Colucci, vice president-sales at Westchester Modular said Tuesday in a telephone conversation. “We’ve shipped a very few to Nantucket but we’ve shipped 10 homes to the Vineyard, including four this year for Bill Potter. It takes a little more coordination with the barges, of course, but we’ve never had any problems or serious delays,” Mr. Colucci said. Mr. Colucci deferred questions on home costs to individual builders because of the wide range of options and choices available. “We know from experience that we can save 15-20 per cent in hard costs compared with site-built homes and there are soft cost benefits, including architectural fees and usually four months of interest on a construction loan, for example, that benefit modular customers,” he said. The Balters were committed to having their new home be part of the neighborhood from the get-go. “We visited each of the neighbors and told them exactly what was going on. We printed flyers with the construction schedule for everybody,” she said. School street was blocked to allow the flatbed trucks to bring the house pieces to the lot. At 5:15 am, Wednesday, the roadblocks were down and a single pickup truck was in front of the Balters’ new home.Public fascination with the instant house brought more than 130 people through it on Thursday for tours and lunch provided by Squash Meadow Construction. “We got a lot of interest from people planning their own projects,” Mr. Potter said. Any concerns? “The only thing I worried about was the barge tipping over on the way from New Bedford,” Ms. Balter said.